This is a story about a special place that only a few people ever get to see. 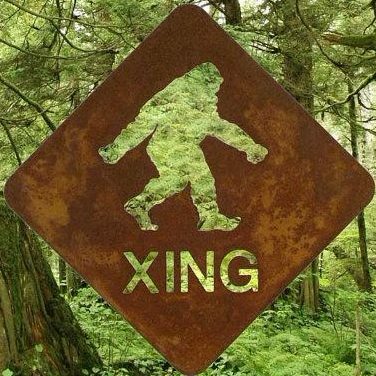 The person in this story does not want his name used but he felt compelled to contact me with it because of my interest in the Bigfoot phenomenon. This was a man with a profession that would or could only be called “credible”. During some time off he wanted to visit his girlfriend in Idaho. He was currently living and employed in Vancouver B.C. He decided to take the long drive down and at 2:00 a.m. he decided to speed up because there was no one on the road except him. He was cruising at nearly 100 mph when he saw up ahead what he described as a “flock of birds”. He thought it odd that a flock of birds would be flying at night? He said that the birds flew from left to right across the road and then formed a vertical column as he approached. Then, without warning, the birds coalesced into a living thing that he said could only have been a “Bigfoot”. He said that he pressed hard on the brakes and came to a stop just short of the creature. The creature then turned and walked across the road in front of him and looked at him as it did so. He described the facial area as that of a very sad looking person. He said that it was huge and covered the distance across the road in just a step or two and then was gone. The man looked up and down for the creature but that was all that he saw of it. Then a sudden fear came over him and he left there in a hurry. The gentleman had entered into what I call “The Parasphere”. The parasphere is a place or time when unexplained phenomena occur. Sometimes to people who have no interest or connection to such events and then find themselves caught up in it and even though they may have lived to tell the tale, they are not sure they have left it all behind. Their lives are changed forever by the experience. This man had a highly responsible job and feared losing it if he went public with such an experience. He did, however, sketch for me the creature that he saw. Most often an experience with the “parasphere” is a singular one and if one survives it he is left with only his memory and the emotional toll of it all. If his mind is not lost in the process then…one day…he may sum up the courage to write to someone like me who has an ear and a smidging of understanding for what they have gone through. The world and its entirety is not necessarily all that we can see. I am very sad Humanity has become so violent & untrusting as a whole. I feel the Sasquatches have MUCH to teach us if we could only communicate. So interested in every aspect of their being. Perhaps 1 day, just hope I am included also.